Despite their best efforts to be “active” and create a lot of noise at Draft16, the Colangelos ended up sticking to the script (No.1; No. 24 & No.26). In the end, they selected three prospects that are receiving very positive reviews from the experts online and the NBA folks I have communicated with over the last twelve hours. 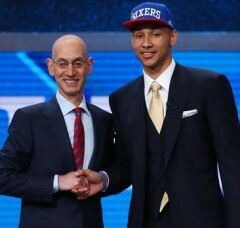 As you know, the 76ers tipped off the the 2016 NBA Draft by grabbing Ben Simmons out of LSU, which according to my NBA contacts was the choice 95% of the League would have made at No. 1. The Sixers made numerous efforts to get back into the Lottery portion of Draft16 but were unable to find a trade partner. So if you fell asleep under a cloud of disappointment, you missed the Sixers drafting two Euros in the late 1st Round — Timothe Luwawu-Cabarrot (at No. 24) and Furkan Korkmaz (at No.26) — who will help this franchise.